PLEASE FOLLOW US ON TWITTER @STANDINGSNYC FOR UPDATES. 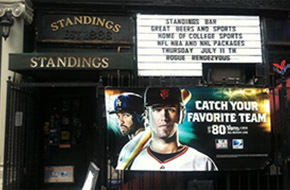 We do not show Pay-Per-View boxing events at Standings Bar. "The first thing you notice about Standings is its size. Unlike other (rightfully) nominated New York sports bars like Foley’s or Jimmy’s Corner, Standings in its entirety is a single, small room, with 10 barstools and three tables on the opposite wall. A packed crowd would be 40 or so of your closest friends. This is not a bad thing, especially for a sports bar: It’s possible to see the bar’s eight flat screens (Standings has all the major sports packages) from nearly everywhere, and the 12 draft lines are never more than a one friendly pass away. When owner Gary Gillis opened the bar in 2005, he wanted to mix good sports with “good” beer, hence the 10 domestic craft lines with options such as Wild Onion Hop Slayer Double IPA, Greenport Harbor Other Side IPA, and Harpoon Brewery’s UFO Raspberry Hefewizen. Of course, there’s Guinness and Bud Light, too, for those fall Sundays when football spans 12 hours and the endurance drinkers need something lighter." What we do best... See for yourself! Come and unwind with a pint (or "MEGA" pitcher) of one of our handcrafted American ales or microbrews and catch your favorite team on one of our 8 HD screens. We have all the major professional sports packages (NFL Sunday Ticket, Champions League, NBA League Pass, NHL Center Ice & MLB Extra Innings) as well as college packages (ESPN Gameplan college football and ESPN Full Court basketball). Track the latest "Standings" on our chalkboard and remember... catching a game doesn't mean you have to drink crap beer! We also have Bud Lite & Guinness on tap, in addition to a list of 25 bottled beers and several house wines. We have HAPPY HOUR specials on our draft beer from 5-7pm Monday-Friday and FREE PIZZA every Friday night at 8pm. Also, check out our frequent promotions in the UPCOMING EVENTS section. In addition STANDINGS, offers a full selection of menus of some of our great local joints such as PAUL'S BURGERS, LOMBARDI'S PIZZA & DAN & JOHN'S WINGS. Just ask our bartenders.